IBM Director is a comprehensive systems manager designed for use across the full IBM Systems server family. An integrated, easy-to-use suite of tools, IBM Director provides clients with flexible systems-management abilities to help maximize system availability and lower IT costs. With IBM Director, IT administrators can view and track the hardware configuration of remote systems and monitor the component performance of processors, disks, and memory. 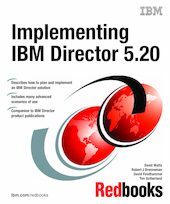 This IBM Redbooks publication describes how to implement systems management with IBM Director 5.20, discussing IBM Director architecture, its adherence to industry standards, and the planning required for a solution. This book covers how IBM Director integrates with the IBM System x service processors and the options available to deploy agents. Tasks include configuring events and alerting subsystems. The book also describes several real-life scenarios employing IBM Director. This book helps you tailor and configure IBM Director while showing you how best to maximize your investment in IBM technology. This book is a companion to the IBM Director online publications and the product CD-ROM. September 2009 update: Corrected a typo.